Join us as we partner with the Pemberton Borough Police Community Association for their 3rd Annual Holiday Toy Drive! 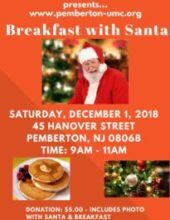 Please join us for the Breakfast with Santa on Saturday, December 1, 2018, from 9 a.m. to 11 a.m. You can enjoy pancakes and take a photo with Santa for a small donation of $5.00. We hope to see you there! 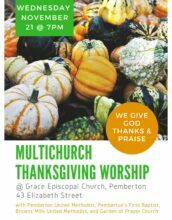 Please join us for this Thanksgiving Eve Service on Wednesday, November 21, 2018, at 7 p.m. The service will be hosted at Grace Episcopal Church. Pastor Carter will be preaching for this exciting event!